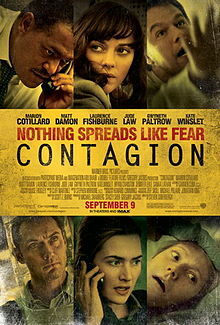 About: A thriller centered on the threat posed by a deadly disease and an international team of doctors contracted by the CDC to deal with the outbreak. Starring: Laurence Fishburne, Gwyneth Paltrow , Matt Damon and Jude Law. This movie does many things right. It effectively illustrates how society can (and probably would) break down rapidly. The movie touches on peoples' belief in social media commentary as though its the bible. People will believe information as long as its semi-credible. False information is spread as quickly as fact in this film. Millions of people die and it is presented in a realistic fashion. Women die. Children die. Men die. No one is immune to the spreading plague. Camera shots linger on door handles, table surfaces and other commonly touched items that will give you instant paranoia about touching anything long after the movie is over.